Three Rivers Press (CA), 9780307460646, 273pp. Men will want you like they want a glass of rum One man will love you. But you won t love him. You will destroy his life. The one you love will break your heart in two. So says the soothsayer, when predicting young Celia's future. Raised in the tropics of Tobago by an aunt she loves and an uncle she fears, Celia has never felt that she belonged. When her uncle a man the neighbors call Allah because he thinks himself mightier than God does something unforgivable, Celia escapes to the bustling capital city. There she quickly embraces her burgeoning independence, but her search for a place to call home is soon complicated by an affectionate friendship with William, a thoughtful gardener, and a strong sexual tension with her employer. All too quickly, Celia finds herself fulfilling the soothsayer's predictions and living a life of tangled desperation trapped between the man who offers her passion and the one who offers his heart. AMANDA SMYTH s short stories have been published in New Writing 12, London Magazine, Firsthand, and New Voices. She lives in England." "A remarkably assured debut, written in a controlled yet vibrant and beautiful prose that makes as much of the heart-stopping landscape of Trinidad as it does the cast of characters who inhabit the novel. A worthy relative of Jean Rhys' Wide Sargasso Sea." Certain novels are alive with color. 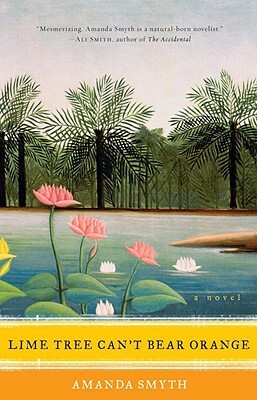 Written in lush, lyrical language evocative of its tropical setting, Amanda Smyth's Lime Tree Can’t Bear Orange is awash with bougainvillea, parakeets, blue crabs, manicous, rum, coconuts and obeah folk magic...Smyth's debut is an absorbing and morally complex read with a bittersweet twist at the end. Born an orphan, Celia's sense of family is tainted from the very start. How does her definition of family change throughout the story? She encounters several different families and many people she could consider her own family in both Tobago and Trinidad. Who does she consider to be her family by the end? Who does she reject? Why? In Chapter 1, Aunt Tasi explains Celia's mother's death to a young Celia by saying, "When one soul flies in another flies out." What other incidents in the novel could this expression explain? Masculinity, especially in terms of the responsibilities of fatherhood and caregiving, plays a large role in the novel. Think about the men in the book—Roman, William, Solomon, Dr. Rodriguez, Joseph Carr Brown. How does each of these men fulfill and/or shirk his responsibility as a male caregiver? Do the women in the novel seem to share a similar relationship with their responsibilities as caregivers? If not, how are they different? "Marriage is not for you. But you could have it if you want it. Men will want you like they want a glass of rum. Drink you up and pee you out. One man will love you. But you won't love him. You will harm him. You will destroy his life…The one you love will break your heart in two." This is Mrs. Jeremiah's prediction for Celia's love life in Chapter 1. When does Celia identify which man in her life is the one man who will love her? Does she try to protect him from his potential fate? Superstition and spiritualism have heavy presences in this novel. What purpose do they serve in terms of both the characters' lives and as a literary tool used by the author? "I believe you follow your life, Celia. You don't lead your life. It's a mistake people make. We're not that powerful or important." Joseph Carr Brown says this to Celia in Chapter 13. What does this mean? Does it seem to hold true for Celia's life? Does she think so? Both Helen and Celia long to go to England. What are each of their reasons? Do you interpret one as running toward England and one as running away from Trinidad? If so, which? Most of this book is short thoughts from Celia or dialogue between Celia and the other characters without much description of their setting. However, there is a real sense of the life and lushness of Trinidad and Tobago within the novel on just about every page. What techniques did the author employ to convey the flavor of the islands without overtly describing the scenery? "I don't want you to be afraid. One day you'll look back and say, I'm glad that happened, it's made me who I am. Your feelings can tell you which way to go, like a compass." In Chapter 26, Aunt Sula says this to Celia to help her through the difficult period after she leaves the Rodriguez household. Do you think Celia looks back at any of the difficult periods of her life and is glad? If so, which ones and when is she able to do this? As his relationship with Celia progresses, Dr. Rodriguez seems to grow less and less discreet and eventually seems careless—or perhaps daring—with their secret affair. Do you think he actually wanted to be caught? Were you surprised at his reaction to his wife's discovery of the affair? Several themes in the novel center on the balance or tension within a dichotomy—white vs. black, family vs. outsider, religion vs. spiritualism. What are more examples of these dichotomies? Which characters can be identified with either side of each dichotomy and which seem to straddle both? Celia could have pushed harder for support from Dr. Rodriguez when she confronted him with her pregnancy. She could have threatened to tell Helen or expose him to others in Trinidad. Why do you think she did not? Celia pays close attention to beauty and the appearance of the people and places around her as do many of the characters. Who and what in the novel is beautiful? Does beauty seem to correlate to something more profound? Home is an important concept in the book. Which characters have a sense of home in Trinidad? Which in Tobago? England? Does Celia ever come to peace with her own sense of home? What is the meaning of the title Lime Tree Can't Bear Orange? By the end of the novel, how does this concept apply to Celia?